East Acton station first opened on 3rd August 1920, as part of the Ealing Broadway Extension of the Central London Railway. The observant of you will have noticed it opened before North Acton station, the review of which I uploaded last week. This was due to me losing track of which review I was supposed to put online next – one mistake after 175 odd stations isn’t too bad! It’s a small station in the heart of terraced housing suburbia in Acton and you could easily miss it if you weren’t 100% sure where you were going. Building wise, there isn’t a tremendous amount going on here. The ticket office is a pleasant enough brick structure while the platform shelters reminded me of those you might find on a small rural station. The Goldsmith Arms is just over a 10minute walk from the station. Head down Erconwald Street until you reach Old Oak Common Lane, from there head down until you turn right onto East Acton Lane. You’ll find the pub where the Lane meets Friars Place Lane. It has a large car park, surely one of the key distinguishing features between suburban pubs and those in the city where you’d be mad to drive to. Its a big pub inside and was bustling on our Saturday evening visit. There were a fair amount of parents with their children here. Its very bright inside which might make it a more welcoming destination for families. Its a Flaming Grill pub – I’ve stumbled on a couple of theirs before in the similarly suburban locations of Eastcote and Wimbledon Park. As you might guess from the name, their menu is heavily based around grilled foods. Burgers, steaks and mixed grills all feature highly. There is also a kids menu which might partly explain why there were so many here! Their calling card is the ‘Flamin’ Guarantee’ – if the food doesn’t meet your expectations, they will replace it. As I said when I first visited one of their pubs, they get my vote solely for having criss-cross fries on the menu! On the ale front, the only thing available was London Pride. The Goldsmith has a wide variety of entertainment options available. As well as a dart board and pool table, there is a Star Trek pinball machine, which was fantastic, as well as one of those grabber machines you usually see in Seaside amusement arcades. Sadly though the quiz machine appeared to be out of order but then again you can’t have it all. They also have a number of TVs and a Sky Sports licence. In short, The Goldsmith is a perfectly decent boozer – spacious in a way that only suburban pubs can be! North Acton station first opened on the Central London Railway on 5th November 1923. Mainline rail services had already been stopping here since 1904 on the New North Mainline, which linked the Great Western Main Line and its services out of Paddington and the Chiltern Main Line services out of Marylebone. The station itself is pleasant if modest, the shelters at platform level are pretty basic as is the ticket office. There is a nice touch here in the shape of a collection of potted plants in the area in front of the ticket office. A mini garden so to speak! The area around North Acton tube is mostly made up of modern office/housing blocks with Tesco Expresses, Dominos and the like underneath, so it felt rather strange to stumble on a traditional looking pub in the midst of it all. The Castle is on Victoria Road which can be reached from the footpath up from the station. Wth its mock Tudor frontage, it looks every bit the quintessential pub among a collection of slightly anonymous new developments. Inside, its fairly spacious. The interior has lots of nice little touches – I was a particular fan of the collage of 1980s football magazines surrounding one of the TVs. There are also a collection of black and white photos of the local area from back in the day. Perhaps not surprisingly given the football display, The Castle has both a Sky and BT Sports licence. It also has a sizeable beer garden. As a Fullers pub, The Castle has their usual range of ales – London Pride, Seafarers and the like. There was also a selection of guest ales, including the marvellously named ‘Proper Job’. I couldn’t resist and gave it a quick try but it was far too sweet for my liking. The pub also caters for fans of the in modern lagers like Brooklyn and offerings from Camden Town brewery. I was getting peckish while we were here, so went for one of their burgers. At £9, its towards the cheaper end for pub burgers these days. It was excellent so well worth the price. Other options on their menu included Fish and Chips, steak, hot dogs as well as a Thai Curry. My friend went for the Sweet Potato Fries which also looked very appetising. It was fairly busy on our Saturday afternoon visit and had a friendly, welcoming atmosphere. That may have been enhanced by a very sweet puppy that was dashing around the pub while we were there. To sum up, The Castle is a top pub in an area which would seem to offer little in that way of entertainment when you pass by on the tube. If you’ve done that before with North Acton, think again and pop in here for a pint! Stonebridge Park first opened on 16th April 1917. Like others on this stretch of the Bakerloo Line, a station here had first opened five years previously for mainline rail services on the London and North Western Railway. It was also briefly the northern terminus for the Bakerloo Line between September 1982 and June 1984, until services were restored to Harrow and Wealdstone. Today, it is also served by London Overground services running from Euston to Watford. Building wise, both the platform shelters seem fairly modern and uninspiring. The one on platform 2 is particularly basic. To be fair, given that the previous buildings have been both destroyed by bombing in World War Two and then subsequently severely damaged by fires more recently, perhaps you can understand why they want to keep it basic! As we got off at Stonebridge Park, I immediately got the feeling there was going to be slim pickings round here. The area around the station is rather barren and dominated by both a large rail depot and the imposing structures of the North Circular. To reach The Heather, head south down the North Circular Road till you reach Heather Park Drive. The Drive curves round, so don’t worry if you don’t see anything at first. The pub is at the very end of the Drive, just past the small parade of shops. From the outside, you might not even notice its a pub. Aside from the sign by its forecourt, there were little other signs of activity when we visited. It was much the same on the inside, we were the only customers bar one other bloke playing on the fruit machines but he didn’t stay long. The barman also disappeared ‘backstage’ after serving us so it was totally deserted bar us for most of our time here! There were no ales so I went for a Kronenberg. The Heather has a rather weathered, gloomy interior. The fixtures and fittings seem dated, especially the lights, as does the dull paintwork. It advertises that it has BT/Sky Sports here – the TV was on but with no football to show, was instead playing a Storage Hunters type show on ITV4. We sat in the main area by the bar but there is also a side room with a couple of pool tables, fruit machines and a dart board. Part of The Heather now seems to be some sort of restaurant. I suspect the rest of it will go the same way and I wouldn’t be surprised if the pub no longer exists by the time I finish the blog. Its the most dilapidated venue I’ve come across since The Pleasure Boat in Alperton last year. Unless you enjoy visiting depressing pubs in the middle of nowhere, I wouldn’t come here! 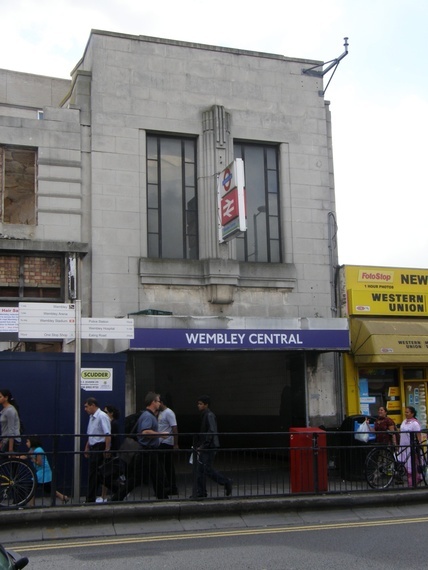 Wembley Central first joined the Underground network on the Bakerloo Line on 16th April 1917. At that time the station was called ‘Wembley for Sudbury’. The main line rail station here actually opened as far back as 1842, then simply called Sudbury. It gained its present name in 1948, one assumes in connection with the the reconstruction work that had taken place at the station ahead of the Olympics that took place in London that year. Like the other stations on the line North of Stonebridge Park, it briefly vanished from the tube map in 1982 before being reinstated two years later. These days there are a mix of services using the station, with trains operated by London Overground, London Midland and Southern all operating here alongside the Bakerloo services. Its a pretty drab station, architecture wise. The platforms are quite nondescript with a robust dark ceiling covering them that supports the development above it. The current ticket hall is based underneath a modern office development – if you weren’t being observant then you could easily miss the station altogether! To be fair, its previous incarnation didn’t look much more inspiring towards the end of its life, as this photo shows. The Liquor Station is a short five minute walk up Wembley High Road in the direction of the stadium. Its based in a striking early 20th Century building that used to be the area’s main post office. It has a quite open, stripped back interior. It opened in its current guise in 2013 so everything still feels fairly fresh here. That said, there are a number of side sections which are set a little further back from the main bar. It was pretty quiet when we dropped by but I guess it isn’t really a Sunday afternoon place. Its open till 1am on Fridays and Saturdays so I have a feeling that’s when it really gets going and they have live DJs and the like. We sat on some of the comfy sofas near the front of the bar. While the pub’s name perhaps doesn’t suggest it, there is usually ale available on tap. Sadly the Bombardier had run out and the Doombar had taken a bit of a funny turn on our visit so I decided to steer clear and went for a Kronenberg. Food wise, the menu mainly consists of Pizzas, burgers and the like. I went for some Cheesy Chips to push myself on and they did the job.. The Liquor Station is a decent enough place to grab a pint if you’re based in the area and definitely one of the stronger options I’ve seen in this part of London. North Wembley first opened on 16th April 1917 on the Bakerloo Line. Like Kenton, the last stop I visited, it had previously opened to mainline rail services five years earlier. In terms of architectural style it is almost identical to Kenton, albeit in better condition. The footbridge looks like it has been painted recently and isn’t being propped up on one side by scaffolding! Its located up Wembley Hill on Dagmar Avenue – you might not immediate spot it as it is set a little way back from the road. It has a rather massive carpark, as you’ll see from my photo in the gallery. The pub itself is pretty cavernous too – it was all pretty quiet on our visit but The Green Man could clearly soak up plenty of pre-Wembley drinkers ahead of a big gig or match. Drinks wise, we were in luck as Doombar was on tap on offer for a mere £2.50 ‘while stocks last.’ The food menu was equally affordable, with very few dishes above £10 – a steak would only set you back £7.29 for example. Talking of luck, there was also a quiz machine which we even won a few quid on. With beer prices as they were, we probably managed to break even here. The Green Man also has a large outside area which was pretty deserted on a cold,grey Sunday afternoon but could really pack them in at the height of summer. It can also serve as a spot to stay before your big Wembley day, as there is a small hotel operating above the pub. The Green Man is a decent enough pub. Its not really near anywhere though, so unless you have a passion for wandering to pubs in obscure locations(guilty as charged), I wouldn’t go out of your way for it.